Accredited Genealogists Ireland (AGI) is pleased to announce that it has been awarded the contract to provide the Genealogy Service at the National Archives of Ireland. The Genealogy Service provides free advice for those tracing their own Irish family history, whether using sources online or in the national record repositories in Dublin and Belfast, or indeed on a local level. On Tuesday 1 November AGI returned to the Genealogy Service after a break of four years. At the same time the service was extended from a half-day to a full-day format, opening from 9.30am to 5.00pm, with a 30 minute lunch break. Each day one of AGI’s panel of fully accredited genealogists is on hand to help and assist with genealogical enquiries, from the most basic to the most complex. 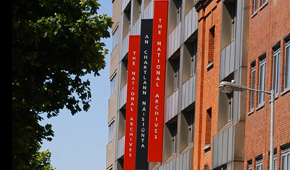 The Genealogy Service at the National Archives began in 2003 when the NAI invited AGI (then called the Association of Professional Genealogists in Ireland) to replicate a service it was already providing at the National Library. Until 2007 AGI ran both services. During that four-year period an international survey of genealogical research facilities for the Family History Library, Salt Lake City, reported ‘the most impressive guidance we saw was provided by the Genealogy Advisory Service at the National Library and the National Archives in Dublin’. AGI regretfully withdrew from the Genealogy Service at the National Archives in 2012 and did not tender for the contract again until now. In the past few years the Genealogy Service was operated by a consortium of genealogists with AGI accreditation. On this occasion the consortium stepped down from the tendering process in deference to AGI. To avail of this free service you must have an NAI Reader’s Ticket. To obtain a Reader’s Ticket you must bring two forms of identification (photo ID and a recent utility bill).